Born on August 31, 1870, in Chiaravalle, Ancona, Maria Montessori broke from the traditional role of women almost right from the start. At the age of 13, she attended an all-boys academy focusing her studies on mathematics and science. Later, she became the first female doctor in Italy. Her career took an unexpected turn when she started working with disabled children. She devised a new method of education when she saw that the methods of the time were not serving the needs of those children. Her approach to teaching disabled children was completely new. Instead of the traditional methods that included reading and reciting, she taught the children by using concrete materials. She determined that learning was not memorizing but sensing and experiencing. The disabled children scored higher than average children on the same test and she wondered, "Why can't all children benefit from the same method?" So it was that she opened the Casa dei Bambini, or Children’s House, on January 6, 1907, in the slums of Rome to teach the children of tenement dwellers. News of her new method spread through Italy and beyond. In 1915, Maria Montessori traveled to the United States to present lectures and demonstrations about the educational philosophy and methodology that she began. Her son, Mario, was a frequent collaborator and travel partner. 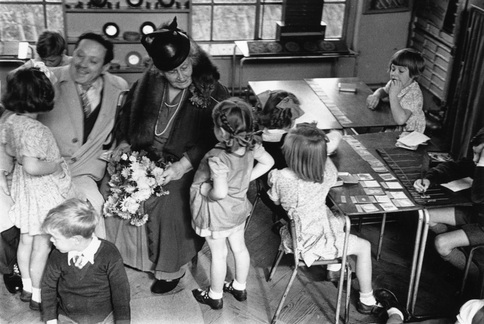 Experimental Montessori schools sprang up in the United States over the following years. Her work was overshadowed, however, in the American public schools by John Dewey’s pragmatic approach to education. 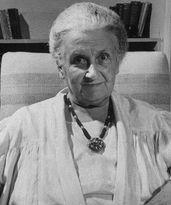 The Montessori method died away until the late 1950s. Alcuin Montessori School was among the first chartered Montessori schools of this revival, founded in 1961. Today Dr. Montessori is celebrated as an educational pioneer, humanist, feminist, and all around inspirational person!